In spite of the great leaps mankind has made in the field of healthcare in recent times, the world over diseases keep on causing untold misery to millions claiming more and more lives. Even as we extol the conquest of one disease after another newer ones keep appearing on this earth. In man's quest for a disease-free world the scientific knowledge and capabilities he has mastered do not seem to fully equip him with the potential to shape the desired outcome. Invisible to us, divine power which dominates the entire universe exerts itself on matters of human health; submission to which is an essential propellant that takes us forward in our saga to enjoy sound health. Our ancestors, who were far more religious and God-fearing than us, enjoyed robust health due to divine blessings earned through true worship wherein mind and soul were concentrated as one on God. Our ancient Shastras speak of the amazing healing powers of Lord Dhanvanthiri, the divine physician of the celestials. 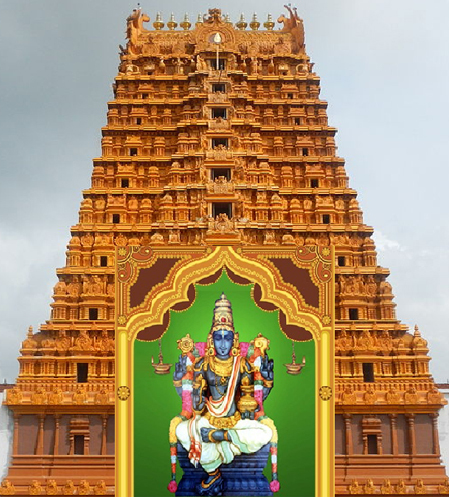 We, at Bhagavan Sri Dhanvanthiri Foundation, with our solemn commitment to find lasting cure for chronic diseases of every description, envisage taking our system of treatment to a newer platform by offering our patients a place of worship, where they can find solace and comfort while invoking the blessings of Lord Dhanvanthiri. Medical Centre for the poor. Health Services to Old Age Homes. Since the project is estimated to cost a couple of crores of rupees, we may not be able to fund it on our own and would need public support. We solicit the kind support of our patrons and well-wishers by way of generous donations and subsequent participation in the project. Being a public welfare project, donations to this are exempt from Income Tax under Section 80G of IT Act.